The second annual Battle of the Border charity basketball event is scheduled for May 9 at the University of Regina's Centre for Kinesiology, Health and Sport. 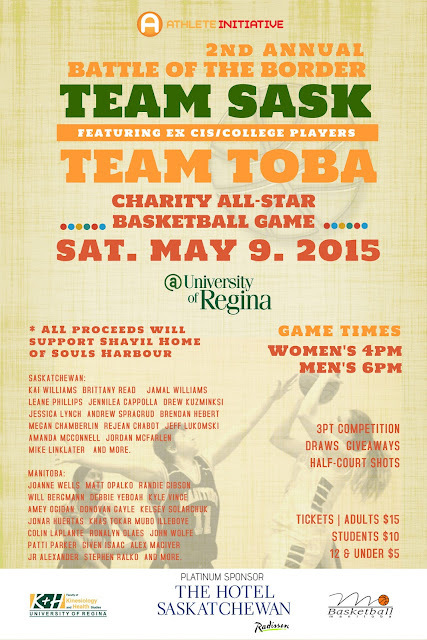 Two games will be held, featuring former university and college players from Saskatchewan and Manitoba. The women's game is slated for 4 p.m., with the men's game to follow at 6 p.m. Confirmed players participating in the event can be seen on the poster. Tickets can be purchased at the door for $15 (adults), $10 (students) and $5 (children under 12). Proceeds will go to Shayil Homes of Souls Harbor - a year-long, residency-based addictions program.